9 years ago, I was not sure if I was ready but I just said yes. The following day was April's Fool and I announced that "I am getting married!" I will never forget this day and tomorrow (1 Apr). Today, I announce that my 3 yrs and 3 mths at work finally paid off. "I am promoted!" Honestly, the salary doesn't make a big difference but the recognition does. A simple "Thank You" and "Congrats" from bosses and colleagues makes my work life and effort put in even more meaningful. Looking back at 3 decades, I think I have lived a good life. 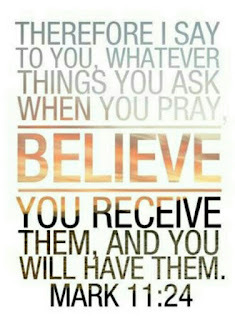 I admit that I am greedy :P I'll continue to pray for even better days ahead! Time flies! 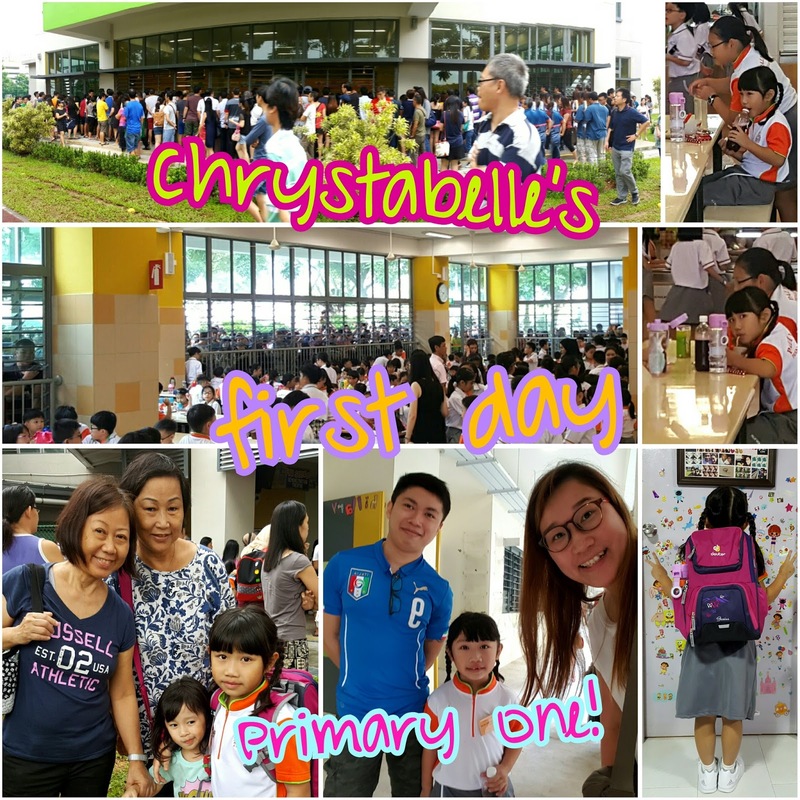 Belle completed her 1st week of Primary One! Things that we talk about this week, is her Buddy Jie Jie, encouraging Belle to walk up from her classroom to hall and subject on time table. Day 2, Belle told me that she will buy a packet of Milo for recess and she did! However, she spilled the milo on her shirt and her Buddy Jie Jie brought her to the General Office to change a clean shirt. When I check her wallet, I realised that she didn't spend a single cent. I started questioning her about her Milo. She told us that her Buddy Jie Jie paid for it! 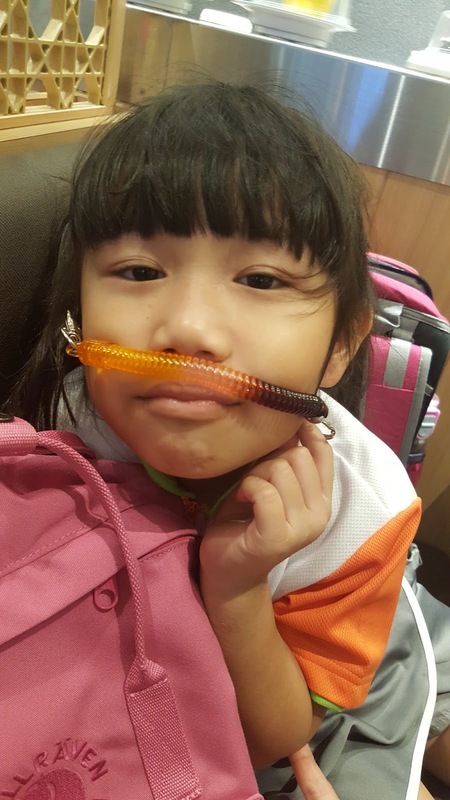 We bombarded Belle with questions and she kept clarifying that she didn't ask her Buddy Jie Jie to pay for her. Lol. So, we wrote a little note with 80 cents in an envelope. I told Belle to give it to her the next day but she was worried she couldn't find her but she actually did found her Buddy Jie Jie on Day 3! Day 3, I was really happy that Belle managed to return the money to her Buddy Jie Jie. Guess what... its even more powerful today. Lol. Buddy Jie Jie brought Belle to the bookshop and bought Belle a little gift! How sweet! 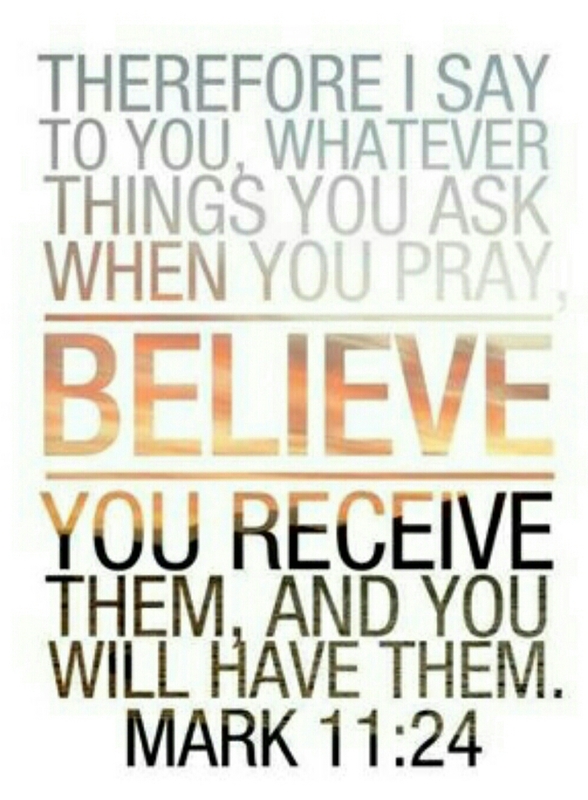 Thank God for this blessing! We decied to give Buddy Jie Jie something in return and Belle managed to pass it to her today! Last few days, I accompanied Belle to her class on level 1 and she will then walk up to the Hall on level 3 for assembly. She is very timid and dare not walk up by herself. So, on Day 2 and 3, I asked the student leader for help to walk her up. As for today, we bump into a teacher when Belle was whinning. He told me to leave and asked Belle to just follow the crowd. As I was leaving, it felt more like me having the separation anxiety! Hahha. I wondered if she is doing fine and I wondered if she will cry. Lol. Anyway, when I picked her frm school this afternoon, she turn out really well! She look happy and was proud when I compliment her for walking up by herself. I have told her, starting from next Monday, we will not accompany her to the class. She will have to drop off at the school porch and walk into her class all by herself. Keeping fingers crossed! 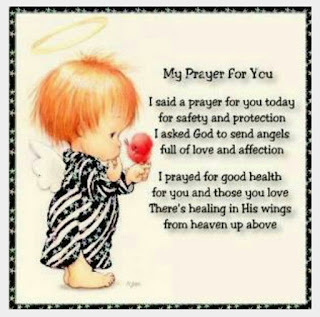 May God please hear my prayers and continued to watch over Belle! I know I am supposed to blog regularly but somehow along the way, I abandoned my blog again. Haha. Wanted to start my very first post on Dayre but I realised its only a 500 word post. O.M.G! Today marks the first day of school for every kid in Singapore. It is also Chrystabelle's very first day in a "real" school aka Primary School! Yes, time flies! She is turning 7 this year already and my first day in Primary One was 26 years ago! Hmm.. coincidentally, 26 is the same number as the age that I gave birth to Belle! Really very qiao right.. lol. Last night, I felt like it was me, going to Primary One. I hate the feeling... last night of school holiday feeling. Lol. When I woke up this morning (at 6.15am), I had the same feeling again! Back to Primary school feeling! My Primary school is in Toa Payoh and I had to wake up at 5.45am everyday because my school bus arrives at 6.15am! Belle is luckier, we enrolled her into a school nearer to home. School starts at 8am but she has to be in school by 7.45am. Being a kiasu Singaporean, we woke up at 6.15am today to get ready for a brand new phrase in her life! She did very well today! Didn't cry at all and followed the instrutions! My first day was terrible! I had really bad separation anxiety! I had to bid goodbye to my mum and walk up the long flight of stairs in my school (to my school hall). Being in a girls school, most of them cried and I cried too! Gosh.. I hate to go to school because I want my mother. Lol. I think I cried for almost a week long! Anyway back to Belle.. they sang the national anthem and said the pledge..
After that, they proceed to class and parents had an orientation. Principal is not bad, told the parents that PSLE is a small thing, just focus on the child's ambition! Somewhat agree.. everyone needs to have a goal in life.. well.. if don't study hard, how to reach our goal?! Right??? Tsk tsk. So recess is from 930am till 10am and school ends at 2pm. She takes breakfast at home and I don't think she has the appetite to eat at 930am. If she don't eat, how can she tahan till 2pm???!! There are alot of parents today and we can't enter the canteen and had to peep from outside. Lol. Thank god I spotted her and her buddy jie jie was so nice! When Belle waved at me (from a distance), her buddy jie jie brought her over, so that she could talk to us! So sweet! Felt like I was visiting a prisoner. Hahaha.. chit chatting with a barrier. Lol. Anyway, we gave her $2 for recess. Having full control of her money, she bought a bottle of grape drink and wang wang biscuit. Seriously, where tot enough to fill her tummy?? 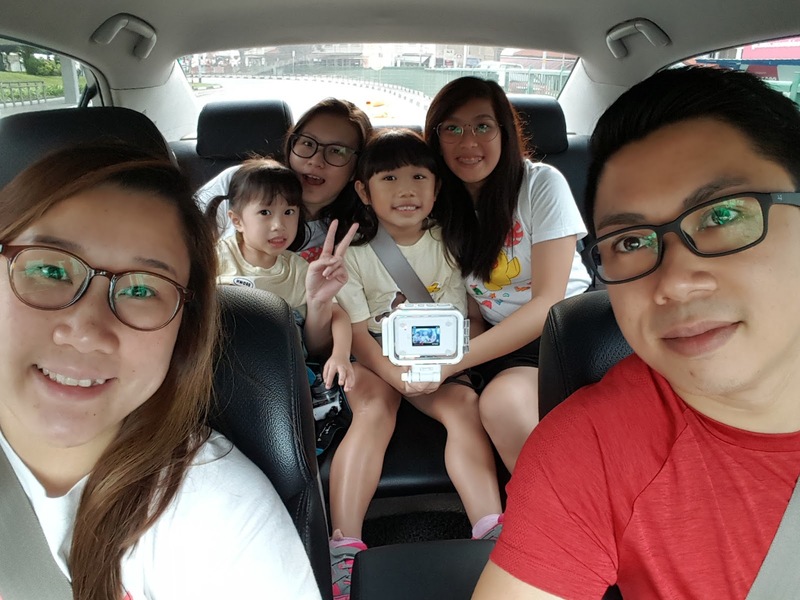 At 950am, I told her buddy jie jie to bring Belle to buy noodle and she did! She sat down to eat about 3 to 5 mins before the bell rang. Lol. But... 1st day, special treatment, she just continue to eat. Lol. After she was done, she returned her tray and dashed off to her next lesson. Well my daughter blames me for being late. Lol. She seems to adapt well and I think parents should really trust the school and the kids! We left by 10.30am and went back to pick her at 2pm. When we got home, I checked her wallet. Ok, reasonable. Spent $1.40 only. I realised there's another $7, hidden in another compartment! Lol. I knew it was from my dad! When my dad came home, I ask him, how much did he put in her wallet. He told me $7 (notes) plus $1.50 coins. Lol. So, today, she actually had $4.50 allowance! 4.50 - 1.60 = she spent a total of $2.90 for recess! OMG!! lol. We had a good chat after dinner. I told Belle that she has to buy noodles first, then she can use the balance money to buy drinks. Let's see how it goes tomorrow! It's fruits day and she said Teacher told her to bring fruits and sandwiches. Hmm.. bring bread to school, means no need buy noodles liao lor? Lol. Means got extra money to buy drinks liao lor..
Allowance is $2 but I put extra 50cent. Total of $2.50 for tomorrow hehe. I can't wait to find out how much she will spend in school tomorrow! Thank God, I think she haven't discover the bookshop yet! Lol. We'll wait and see! Now... they are stalking me!! Re-introducing my nieces, Suki Lim & Germaine Tan! I used to look after them and now its pay back time. Hehehe. Time for them to look after Belle and Clari! Since I am already doing research on Port Dickson and Malacca, thought of just sharing this. My friends and I are planning a short trip during the June holidays. 5 Families will be going, a total of 10 adults, 5 children (age between 2 to 8) and 2 babies (between 5 to 7 months). I am looking forward to it because this is the first trip that I am travelling with my friends and that many children! So, we started off with just 1 night at Port Dickson. Grand Lexis Hibiscus is the new kid in Port Dickson. New Villa with private pool and starts from 780 malaysia ringgit (MYR). The purpose of this trip is for everyone to play and eat together. If each family swims in their own villa, when do we meet? hehe. Go to hotel pool? If so, what's the purpose of taking or own private pool villa? We can have nice room and perfect plan for everyone to do things together. Malacca Hotel, I stayed in Equatorial Hotel before. That is why I recommend that because it is just next to a shopping mall. The famous Jonker Street is probably about 10 to 15 mins walk away. Equatorial Hotel is probably like OG Orchard Point. Shopping Mall next to it is probably like Center Point. However, Jonker Street is slightly further. Probably like Forum Shopping Centre. Sun 12 June, return back to Singapore. Mon 13 June, return back to Singapore. It will be cheaper to stay in Avillion Port Dickson on Sunday (instead of Saturday). To save some money, I will suggest to go with Option 2 (Sat to Mon), if you want to spend 1 night in Malacca and 1 night in Port Dickson. hehe. So, what about 2 nights in Malacca? Friday to Sunday is cheaper or Saturday to Monday is cheaper? Sat to Mon is cheaper but the difference is not much. Probably cheaper by about MYR10 only. I personally prefers to travel on Fri to Sun. Premier Room rates at Equatorial Hotel cost about MYR296 per night. 2 nights = MYR591 (rates for 2 adults with breakfast and WIFI). So, let's compare the difference! Conclusion... if we were to go Port Dickson, it will be more expensive by about MYR314. To be honest, there is nothing much to do in Port Dickson. So, our preference will be 2 nights Malacca. No need to unpack, pack and unpack, pack our luggage so many times! Well.... we have 5 children and 2 babies! Hurray! We finally decided to take 2 nights Malacca. Shall share in my next post on my super indecisive hotel decision! lol. Club Lounge in Equatorial Hotel. Daily Breakfast, Evening Cocktails and all day drinks are inclusive in room rate. It is my second day here! Another two more days to go! Had my most memorable dinner in Bangkok last night! 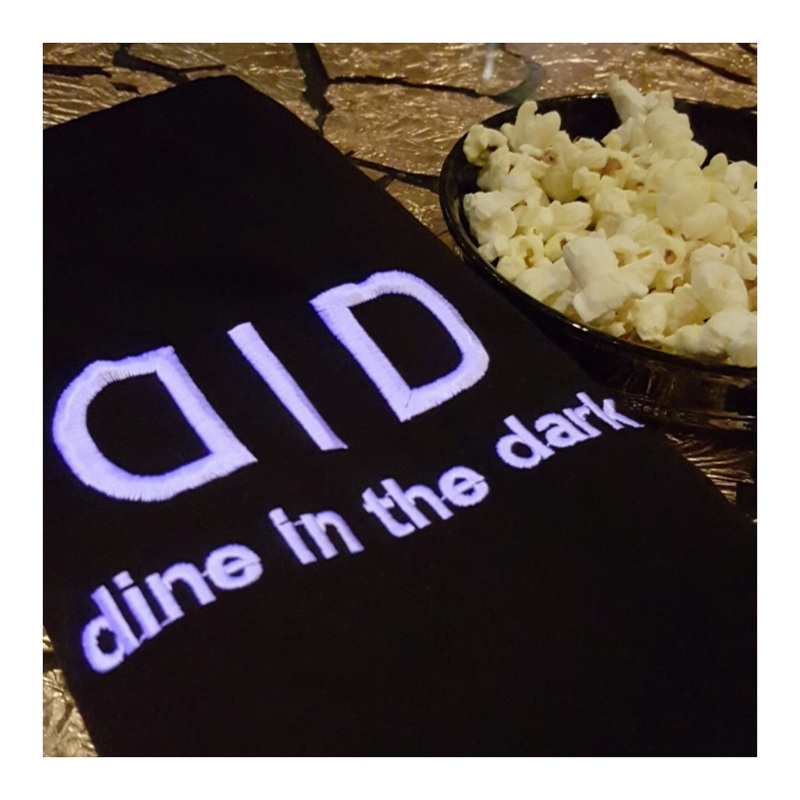 It's Dine In The Dark at Sheraton Grande Sukhumvit! 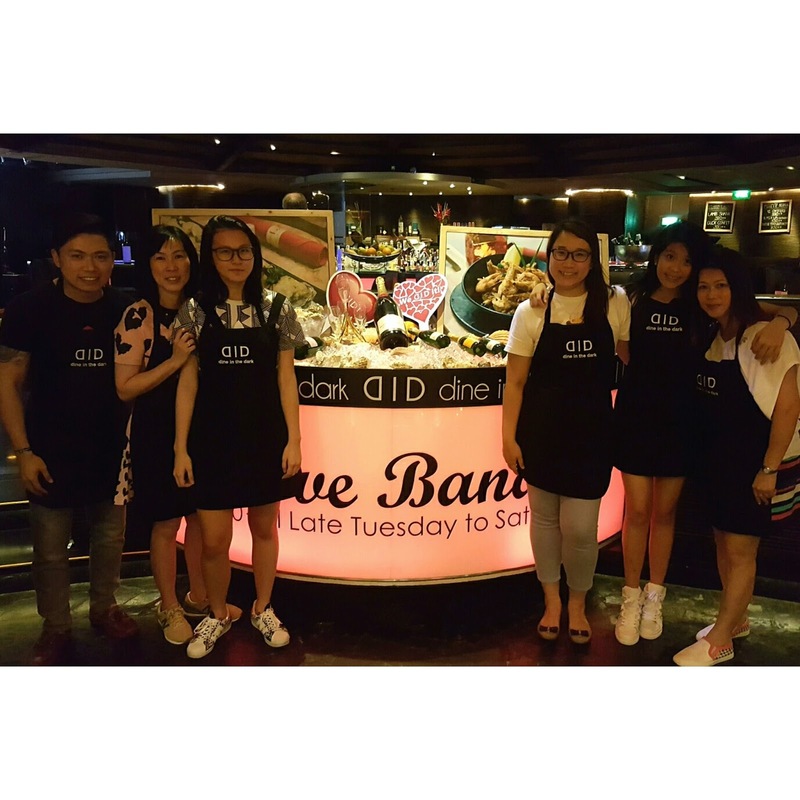 The Dine In The Dark restaurant is located inside BarSu. Before we enter the restaurant, they provided us with a locker to keep our mobile phones and bags. We pre-ordered our prefered cuisine -Western, Asian, Vegetarian or Surprise. We wasn't told about what we are going to eat but we could indicated the items that we do not want to eat. They staff at BarSu, introduced us to our visually impaired guide, New. He is awesome! You will know why after reading this post. After we got comfortable in our seats... we felt better and could breath smoothly! With our ears, we figured out who was sitting where! We spoke so loud that we thought we were the only guests there but actually... theres like another 3 or 4 groups of couple there. Lol. Trust me, its really fun if you go in groups of four. New explained to us what items and where it was placed on the table. Shortly, our first course was served by New. Yes, he served all every single course! To start off, I will advise to use your hands. It is much easier to use your sense of touch! Food is really delicious and we guess what we ate at every course. New is really awesome! He taught us how to pour water from the jug into our glass and kept asking if we were alright. Very very attentive! Slowly, we learnt how to eat with cutlery. Haha. Soon.. we gaied confidence and started passing ood to each other. Hahaa I even learnt how to feed my hub who was sitting next to me! take it slow and do not panick... fast movement will cause you to spill your water or even drop stuff. Lol. Sometimes your might even think that you have lost your cutlery... but do move yours fingers everywhere twice or thrice cause.. it might probably be below your plate. Haha..
Want to try passing food around? Its easy... both person just reach out your hands 45degrees and swing repeatedly left to right. Trust me, you will be able to catch each other hands in less than 5 secs. How fun! I am not going to tell you what I ate. Hehe. 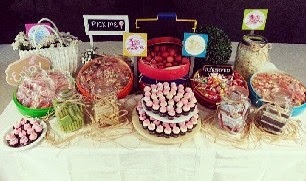 The food is good cause my fussy/picky niece who do not eat alot of things.... actually finished every single course! Oh... just that we are not a vegetable lover. Hahaha... so New heard that and we were so thankful when he asked if we would like him to inform Chef to exclude vegetables in our Main course! Lol. New kept checking on us and ensure that we are doing oki. We were so well taken care of and the portion was generous! 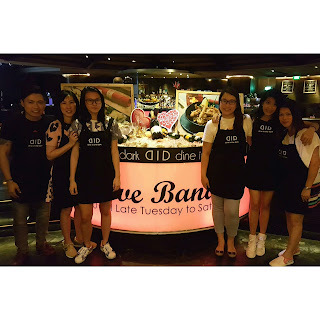 I really love the food and the entire dining experience. If I could, I will definitely visit them again! If you are interested in this unique dining experience... enjoy discount by purchasing your vouchers online!